But do those music-licensing fees make sense? 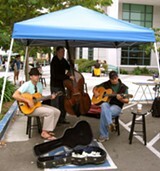 Musicians may have a tougher time playing local farmers' markets. A few weeks ago, we reported on how some small local businesses are getting caught off-guard by the copyright law that requires them to pay BMI and ASCAP (the organizations that collect music licensing fees on behalf of songwriters) — basically, any business that features music, whether prerecorded or in a live setting. Well, it turns out that ASCAP is requiring farmers' markets and house venues to pay as well, which will mean fewer venues for local musicians. Yet it's questionable whether those fees are really supporting the musicians they intend to help. 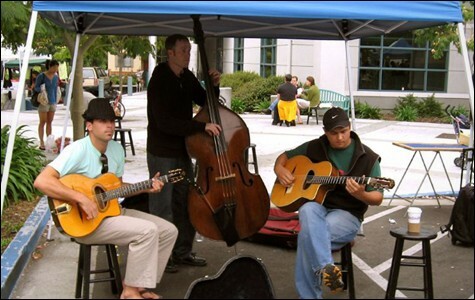 Since 1988, the Pacific Coast Farmers' Market Association has booked live music at its numerous weekly farmers' markets around the Bay Area. But late last year, ASCAP told the Concord-based nonprofit that it owed tens of thousands of dollars for providing that entertainment, and would have to pay a regular fee to continue doing so. "They're cracking down on farmers' markets across the nation," said Stefan Robinson, marketing and promotions manager for Pacific Coast. "They're going after everybody right now." Robinson said the association and ASCAP reached a settlement agreement — the terms of which he declined to disclose — but said the result will mean that about half of their 69 farmers' markets will no longer have live music, including the markets in Fremont, Irvington, all the Kaiser buildings, and the Saturday market in Livermore. Apparently, this is a national trend. Last year, the nonprofit Farmers Market Coalition sent out a notice to its members about the crackdown of live music at farmers' markets across the country. "Last fall, we started hearing from our members about organizations like ASCAP applying pressure to some farmers markets to pay licensing fees for the playing of music on site, regardless of it being an unpaid service to the community," wrote coalition Executive Director Stacy Miller in a newsletter. Whether or not the market organizers charge ticket prices or pay the musicians, "If such musicians play copyrighted music as part of a farmers market, that market, or the hosting organization, is legally obligated to pay a licensing fee, just as shopping malls, cafes, and other stores pay licensing fees in order to play recorded music over their loudspeakers, or host performing musicians. While farmers markets are altogether different creatures than shopping centers, the legal realities of copyright law cannot be avoided simply because our missions are lofty." Farmers' markets may not seem significant as live music venues, but for some musicians, their absence as an outlet spells the loss of another much-needed revenue source — however small it may seem. 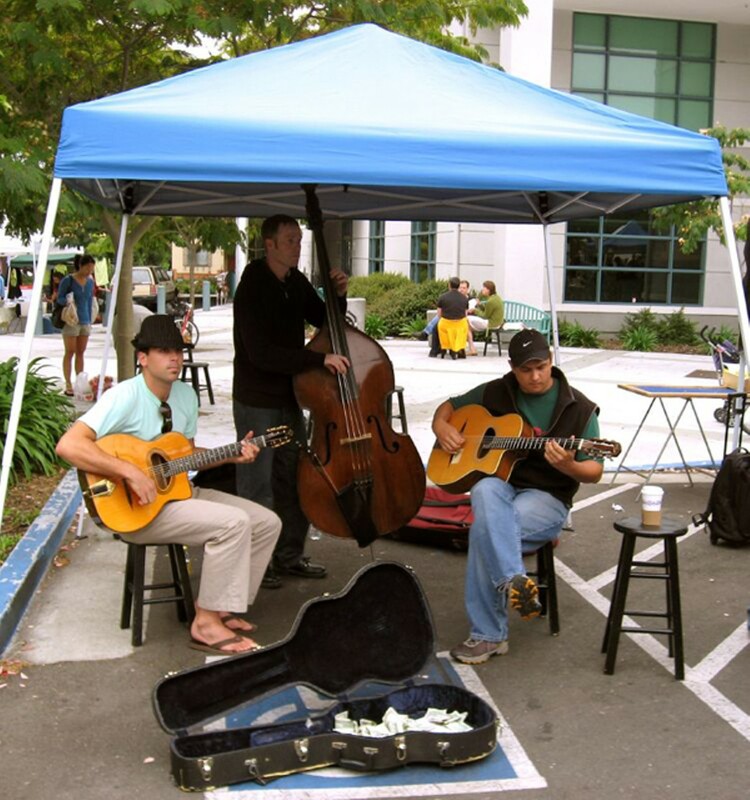 "For me, personally, it's a total disaster, because the majority of my income as a musician was coming from those markets," wrote Paul Anderson, a musician who plays every week at farmers' markets around the Bay Area, in an email. "If you do the math ... we are talking hundreds and hundreds of gigs cancelled for the year (and all the years to come), and tens of thousands of people who will walk into silent markets." And, he worries, smaller markets will feel the ripple effect as they may also be targeted: "That's the reality we are entering into," wrote Anderson, "no public music performance in markets, because the markets can't afford the fees." As it was, Pacific Coast only paid the musicians a nominal travel stipend (about $25 per event, or four hours). It's the tips that provide the artists their main revenue. According to US copyright law, any music played outside one's circle of friends and family is considered a "public performance," and requires permission from the copyright owners — including a CD you've bought or songs off your iPod. Likewise, a musician playing live might potentially play copyrighted music — either his or her own, or someone else's, if they're playing a cover. That's the grounds upon which ASCAP is basing its requirement that farmers' markets pay music-licensing fees. In the case of the Pacific Coast Farmers' Market Association, Robinson said that ASCAP is operating under the assumption that copyrighted music is being played, regardless of whether it is or not. "They are assuming that because they can't be at every market, it doesn't matter — they assume that that copyrighted music is going to be played. ... I feel this is mostly unfair, not only to us but the musicians themselves, because now a lot of them aren't going to show up at the markets." ASCAP did not respond to this reporter's queries. But Ari Surdoval, BMI's director of corporate communications, explained the organization's stance in an email: "BMI does license some farmers markets, if they are not already covered under a city or municipality's general license," he wrote. "If not, they generally get a shopping center license, which is about $165 per year — about 45 cents per day, an even lower minimum fee than our bar and restaurant license." But the Farmers Market Coalition questions whether farmers' markets should even fall under the same licensing regulations as a venue that regularly hosts live music and charges a door fee. "We have found that the charity concert venue license, while not entirely applicable to farmers markets, may be an appropriate avenue for some situations in farmers markets, which are more closely aligned with community fairs than malls or bars," Miller stated. "This licensing structure can be applicable as long as any proceeds generated by such an event are contributed to a charity other than the licensee." It's also possible for farmers' markets to avoid ASCAP and BMI fees altogether, according to the Farmers Market Coalition. It recommends that market organizers draft an agreement with its musicians to not play copyrighted music — either their own (if they're a member of ASCAP or BMI) or someone else's. "If none of the songs performed are within the respective BMI or ASCAP libraries of licensed works, then there is no issue," wrote Miller. "Simply playing music is not a copyright violation that can be enforced unless the work is protected, i.e. duly registered with the Copyright Office, and assigned to ASCAP or BMI." BMI's Surdoval did not respond to whether such a clause would be sufficient to avoid paying royalty fees. However, the Farmers Market Coalition noted that it's not enough to simply state that you won't have copyrighted music, as both BMI and ASCAP have "investigators who visit venues playing music (live or recorded) and identify music included in the works held by their employer." If those investigators confirm copyrighted music was played without the proper license, it can become the basis for legal action. As we've previously reported, BMI makes every effort to avoid taking cases to court, but when it does, it typically wins. It's not just farmers' markets feeling the pinch. House venues are also finding themselves the target of BMI and ASCAP. Jimmy, who only wanted to go by his first name, runs a house venue in North Oakland. He usually books music that's under the radar: world, folk, vocal music, and jazz. But last November, he says ASCAP contacted him and told him he had to start paying a licensing fee of $222 a year. House venues haven't traditionally been in the purview of music licensing, but that appears to be changing: Jimmy says he knows of another local house venue operator that's also being targeted. While Jimmy acknowledges that the fee is relatively low, the amount would still place a burden on him. He says he's retired and lives on a fixed income. What troubles him most, however, is that he doesn't see ASCAP and BMI as actually supporting the musicians they claim to be helping. He did an informal poll of the musicians he books, and found that while a small number of them were members of ASCAP, they were outraged that the organization was demanding he pay a fee, and said they had never received any royalties from them. He also found it inappropriate to be categorized in the same fee structure as a venue that has 1,000 seats. "I started doing what I do to support my friends that are starving artists," he said. "But I'm not helping those artists by doing this. ASCAP doesn't care what music I play — if I play Turkish folk songs or African songs from Mali, if I do cover tunes. ... So if the publishing world allows ASCAP to collect money from me on behalf of artists and those artists don't get it, that's just wrong." So how do ASCAP and BMI know when copyrighted music is being played? While ASCAP did not respond to our queries, BMI's Surdoval pointed us to an online explanation of its live royalty system, which is divided into three categories: pop, classical, and BMI Live. For pop concerts, BMI uses an "independent source of live pop concert information to identify and create a database of the top 300 concert tours and/or concert events/festivals each quarter." Royalty payments are then calculated after obtaining set lists from the headliners and opening acts. For those not in the top three hundred tours in the country, BMI recently launched a program called BMI Live, which relies on musicians to file gig reports of their own to verify copyrighted music played live. ASCAP's royalty payment system, as outlined online, was a complicated formula involving seven different elements, including "licensee weight," "use weight," and "general licensing allocation." Jimmy says he would be happy to pay ASCAP fees, as long as he knew the money was going to the musicians he's actually booking (he pays his artists a cut of the door fee, which ranges from nothing to $20, depending on what the artist chooses). "Because I value the arts with all my heart, I would gladly pay ASCAP if a) the rate was reasonable, and b) the money actually benefitted the artists that I present. ASCAPs contract is a guarantee that the artists will never see the money."